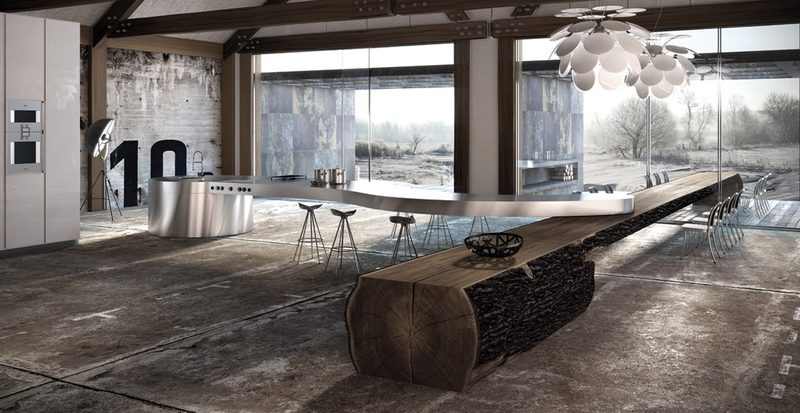 Kitchen Design Think Tank: Wood and Steel! This is a powerful design showcasing beauty and strength as well as an impressive portion of human imagination. There is an unspoken contradiction between the materials here which works wonderfully allowing the smooth, polished steel to merge seamlessly with the raw and unrefined beauty of wood. Boasting a seven meter oak dining table and an impressively curvaceous stainless steel bridging element the sheer scale of this design is inspiring. This kitchen dominates the entire internal and external space, replacing the need for traditional furniture and providing a quirky fusion of precision engineering and nature. In the beauty stakes it appears nature is taking on the power of machines and winning! The design has also been allowed to meander throughout the architecture even breaking free and escaping beyond its traditional architectural confines. The impressive architectural getaway appears to run seamlessly though the glass panels creating internal and external seating options for the masses!